Do you love the idea of having your lights turn on automatically when you enter a certain room? Do you hate the idea of having to spend hundreds of dollars on a smart home solution and Wi-Fi connected lighting? Well, there’s another option that’s much simpler and much cheaper. 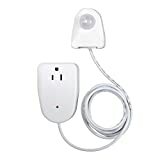 Plug a Westek MLC12BC-4 Indoor Plug-In Corded Motion Activated Light Control into any standard wall outlet, then plug a lamp into the box. Presto! You now have a motion-activated light that will turn on anytime you enter the room.